Yesterday, I showed you my first hand-made Christmas gift for this year, hand-knit dish cloths. There was a little more that I wanted to add about the subject of beginning knitting, in case one of you is also a beginner, and attempting to make these yourself. I know, many of you are much more experienced knitters than myself. In no way am I suggesting these tips would help better knitters. Just tips to help someone who is just starting out. Avoid paying full price for your knitting supplies. Shop sales, use coupons, and buy at thrift stores. Michael's (the craft supply store), often has either a great coupon (50% off), or a good sale (40 to 50% off) on their yarn. Jo Ann Fabric's seems to always have a coupon out for at least 40% off, sometimes as much as 60% off. If the yarn is on sale, but the needles I need, are not on sale, I've been able to use a high value coupon on the needles, buy my yarn on sale, and come out spending about half of retail prices. Thrift stores have a spot, usually tucked away, with needlework supplies. If you thrift much, just make a run past that section, and check out what they have, each time you're in their store. Know the retail prices for the items you might find. If your project requires stitch markers, you don't need to buy anything. Find a cheapo plastic straw in your kitchen and a pair of scissors. Snip off bits in 1/8-inch increments, for however many stitch markers you need. So long as your knitting needle can fit through the straw piece, this will work for a marker. Need a larger marker for really fat needles? Open up and bend a paper clip into the size marker you need. Before you begin a project, do a sample of the stitching. A small patch about 2 and 1/2 inches square, will be enough to get the hang of what you're trying, and a chance to change your mind, if it feels too difficult for your level. Also, at this time, check your work against an online tutorial or with someone you know who knits well. I discovered that my purl was wrong, during my last sample. Better to catch it on a sample, than at the end of the project and discover I'd done it all wrong. As a beginner, knit in quiet. Don't try to knit with the television on, or listening to music, or carrying on a conversation with anyone outside of your own head. Learning to knit is just like learning any other new skill. It requires concentration. You wouldn't attempt learning to drive with a bunch of distractions in the background. Think of learning a new skill as training your brain. Until your brain is well-trained in this skill, those distractions will cause you to make mistakes. And try counting out loud, if you have to. "knit 1, purl 1, knit 1, purl 1". Something about saying the words kept me on track with this pattern, in the early rows. It also guarantees that everyone will leave the room, and leave you alone to your knitting, giving you that un-distracting space to learn. Find the "checks" in your project's pattern. The checks are what I call how you tell if a row of stitching is on track or correct. For instance, on my dish cloths, the pattern is in an even number of rows, all the way through -- 4 rows to each section of the pattern. You know the yarn tail from casting on? Well, I know that if I'm knitting towards the yarn tail, I'm on an odd numbered row (row 1,3), and if I'm knitting away from the yarn tail, then I'm on an even numbered row (rows 2,4). How does this help? In the pattern for the body of the cloth (not including the all-knit stitch edges), the pattern goes as such -- (row 1)K,K,K,P,K,P,K . . ., (row2) K,K,K,P,K,P,K . . ., (row 3) K,K,K,K,P,K,P,. . .(row 4) K,K,K,K,P,K,P. . . Rows 1 and 2 begin and end with 3 knit stitches then switch to purl, knit, purl, knit, and rows 3 and 4 begin and end with 4 knit stitches, then switch to the purl, knit, purl, knit. If I know what direction I'm working on (towards tail - rows 1,3, or away from tail - rows 2,4), I can figure out where I am in my pattern of 4 row-pattern. This comes in handy when your mind wanders and you lose track of what you should be doing. Also, on these dish cloths, if I come to the end of a row, and find I only have room for 3 knit stitches, when I was thinking I was on a row than ended in 4 knit stitches, then I know I've made a mistake along that row, somewhere. And I can fix it before I go onto the next row. That's what I mean by the "checks" in my project's pattern. Those little details that tell you if you are on the right track or not. Don't try to knit commando-style (this has nothing to do with going commando, that one is totally up to you). Don't force yourself to knit for hours on end. Just knit in small fragments of time. Promise yourself that you'll just do one or two repeats of the pattern, then get up and do something else. When learning a new skill, mind-fatigue can set in, and that's when you're most likely to make a mistake. 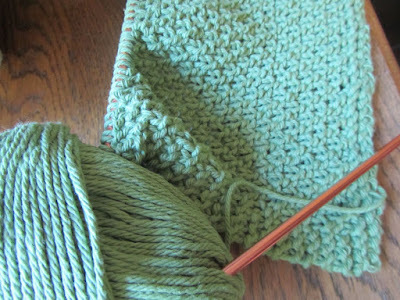 If your knitting has a repeating pattern, try to always do your work in sections of repeat. You will always know where to start up again -- at the beginning of the repeat. And if you do have to leave your work in the middle of a section, to say, answer the phone, write down on a slip of paper, where you are in your pattern and what to do next. And if you have to track how many sections to knit, write those down, tally-mark style, on a slip of paper, as you complete each section. And when you make a mistake (it's not an "if" situation, all knitters make mistakes), don't give up. Don't even unravel to the beginning and start completely over. Force yourself to make an attempt to fix your mistake. Sometimes, it will mean undoing 1 row of stitches, sometimes it will mean undoing 4 rows of stitches. If you at least try to fix the mistake, there's a very good chance you won't have to redo the whole thing. Get someone else's input on your mistake. Ask someone to help you undo it, if you need. For me, all it took was some emotional support from my daughters, when I went to undo one row. Then the next time I made a mistake, I felt confident to correct it all on my own. You see, learning to knit is as much about learning to correct your mistakes, as it is learning the stitches. And your progress will be greatly hampered, if you don't work at learning to correct mistakes. And this brings me to an obvious tip -- if while you're making a stitch, it feels "wrong", "tight" or something else, stop in your tracks, and look it over. Maybe you've not picked up the full loop of yarn, but are missing a very thin strand of it. Or maybe, you've picked up more than you should, on the end of your needle. If you stop, right at this point, and figure out why it feels wrong, you can save yourself a lot of correcting work, 10 minutes from now. Go by measurements and not by row numbers, when working someone else's pattern. Your knitting may be looser or tighter than the person who wrote the pattern. With my dish cloths, if I had knit the cloth exactly the number of rows specified, my cloth would have turned out to be about 8.25 inches wide by 7 inches long -- not square at all. And her pattern had me measure to 7.75 inches long. She didn't specify how wide my 35 cast-on stitches would become, once knit. Mine came to 8.25 inches wide. And the border of 4 knit rows on my knitting was 3/8-inch long/tall, so the length of my knitting, before adding the border on the final end, should be 8 1/4 inches minus 3/8 inch, or 7 7/8 inches. Only 1/8 inch difference, but it would make the cloth not quite square. And since I do have the ability to make it square, shouldn't I try? So, use measurements as your guide. You'll be more satisfied with the results. And finally, take the time to do a clean job in finishing your project. Leave about 6 inches of yarn for the tails. Weave the tails in neatly, wrapping around a couple of stitches, here and there. Try to do this in a way that is not visible to the front side. Then cut the last fraying bits of the tail, clean away. How you finish a project can make a simple dish cloth look well-done, or sloppily slapped together. It makes a difference. And once that first project, following a pattern is complete, do another, just like it. And then another, and another. Really master that one item. You'll soon be able to make them with ease, and you will have that same basic stitch pattern down pat, to use in a future project. I'm on my way, with getting this pattern mastered. I've now completed almost 2 of these dish cloths. Hand-knit household items make great gifts, if you happen to knit, say, 10 dish cloths. These are my rudimentary ruminations, from one beginning knitter to another. I didn't learn to knit until I was well into adulthood. And I mostly learned from books. My daughters had the fortune to learn to knit, through their high school. Knitting qualified as a "art" class. They had a very talented knitter on staff at the school, who could walk them through large projects, helping them to correct mistakes, showing them how best to hold the needles and yarn, etc. And so, that's why they are my resident "experts" when I have a problem with my knitting. You do a good job at breaking down the process of knitting for beginners. I usually use twist ties that come off bread bags for stitch markers. I didn't give this much thought. I just used what caught my eye first and it seems to work. Straws seem like a good idea however they may not fit bigger needles. Very good advice about making something multiple times until you are very familiar with it. However, my pattern has been to move on to something else because I get bored. It still may be a scarf, say, but I may change pattern, knit with two yarns instead of one, and so forth. Interesting, ditto for me on both...twist ties and I have to tweak the next one to be a little different. I usually like to start with the yarn and let the yarn dictate the pattern, or what it wants to become. Sometimes it starts with the pattern, then it helps to have a variety of yarns to choose from. That's why I collect yarns of all colors, usually wool, but if unusual and the price is right, I'll buy it for my stash. I recently bought wire organizer shelve cubes to keep the yarns sorted. Just like beads I have to keep buying and collecting. And fabrics, I guess I am a "maker" of things. It keeps my mind and hands happy and busy. Usually my designs are too quirky to give anyone, let alone use it ourselves. My DIL suggested that I try to sell the things I've made, my purses and bracelets, and now rugs. I guess I feel I'll lose my freedom to make what I want if I have to worry about appealing to others. The problem is storage, but I keep making more stuff. Oh yeah, twist ties would work great. You can also just tie a loop of colored yarn, and use as a stitch marker. When my daughters took a knitting class in school, they had to buy stitch markers, as part of their supplies. Oh well. I know, I get bored too. I try to switch it up, by changing color of yarn. But continuing to make the same item over and over for gifts, does help me master a stitch-pattern so I can do the same on a hat or scarf. I'm still a beginner and need a lot of repetition. The current pattern I'm working would be nice in a garment. That's an interesting thought, about if you sell your items that then you might begin to lose some of the creativity. My grandmother was an artist. She knew that she had to sell her work to support herself. In many cases, she was given complete creative freedom. But in a few pieces, the buyer was dictating what they wanted and this just wasn't very satisfying for her. It's a fine line, to create as you desire, but still hope to find appreciators. What an honor and legacy to have an artist in the family!! Sounds like your grandmother was a successful artist. What did she make? I really admire those artists who are so talented that whatever they make is appreciated, and can be given or sold. Unfortunately, I don't think I can muster enough talent for that. For me, it would be a conscious choice and effort to study what appeals to others and try to emulate. Then it wouldn't be what I wanted to do. If I can personally use what I make, then that would be good enough for me. Have a good day too, Lili! I need to work on holding the needles. I know there is a better way. My daughter told me she'd show me how to hold them better, to make it all go faster. And I think her way is Continental. How very nice to have been a part of that knitting group! What a fun thing to do each week. Hmm, giving me ideas. . . Thanks for clarifying, Lili! I am going to try to knit this washcloth but it will have to wait until we hit the cooler temps. It is just plain too hot to work with yarns right now. Oh, I understand with the weather. Hot and steamy are not exactly conducive to wanting to have a ball of yarn on your lap! Good luck with it, when you get to it. In the meantime, have a great day! My mom always knits with the left needle tucked kind of into her armpit to hold it in place. That way both needles don't "dangle". I don't have needles with me to get the feel but I think the right side is more left alone. I will go home and get some knitting needles and pretend to work to see. That tucking of the needle into the armpit is a Dutch way of knitting. I've heard about the Dutch knitting style--probably from the women at church--I'd like to see someone knit that way sometime. Seems like it would be hard if you had something bulky that you were knitting, but maybe I'm picturing it wrong. I have never heard of the Dutch method of holding the needles. I may give that a try and see if it speeds me up. Thank you! West Michigan has a large Dutch population so I think knowing about that style if knitting is a regional thing. My MIL (of Dutch descent) doesn't knit that way, however. Just a little bit every day, and soon I'll be finished with my current set of 3. Have a wonderful day, Jayne! I laughed out loud at the thought of knitting commando. That's a scary image! ;) These are great tips. I have found skilled knitters at church as well as at my job--it's surprising where they turn up. And I've been able to get help from clerks at yarn stores, although then I feel pressured to purchase more expensive yarn. It could be the answer to the problem of not wanting to knit in the heat -- commando might make for cooling breezes! I do know a couple of ladies at church who knit well. I really should ask them for help, some time. Although I know how to knit (I've actually knitted 4 needle mittens...more than once...and even wore them), I prefer crochet. My mom taught me to both knit and crochet when I was maybe 10-12. It is almost unheard of for me to buy any yarn or supplies without coupons. In my area Joann's will take as many coupons as you have. Michael's isn't quite as coupon friendly but both stores will honor each others coupons. Also, if you sign up to receive coupons by email for the various craft stores you will find yourself with many opportunities for discounts. Hobby Lobby also has coupons but they will only accept one coupon per customer per day. What I've discovered (in my area anyway) is that Hobby Lobby has the best, most varied yarn selection, Joann has the best coupon policy and Michael's usually has the best price (before discounting). But nothing can beat a huge basket full of yarn (acrylic and wool) I found at Goodwill several years ago, all in good shape, some skeins brand new, and not "thrift store smelly." I hit the jackpot that day! Good luck with the knitting! And maybe someday you might just give crochet a try.